Peel, whose fast-casual operation Prawn will open later this month, is serious about offering seafood at an accessible price. Later this month, legendary L.A. chef Mark Peel will transform his Bombo seafood stand at Grand Central Market into Prawn. 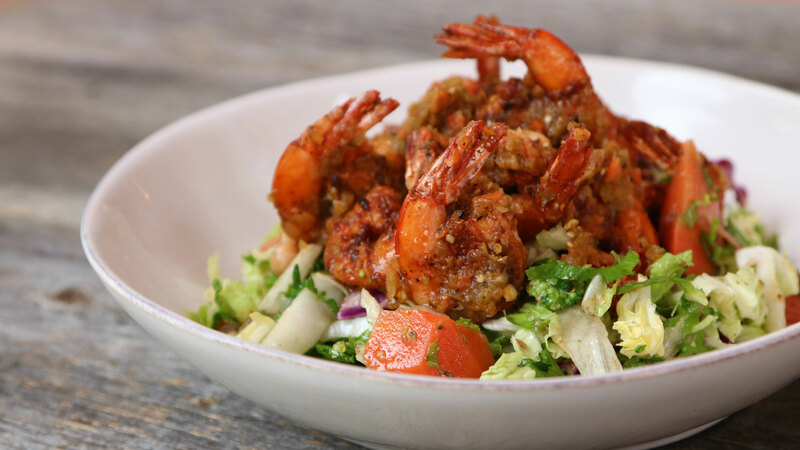 Prawn will be a fast-casual operation that, as you might have guessed from the name, will be even more seafood-focused than Bombo. 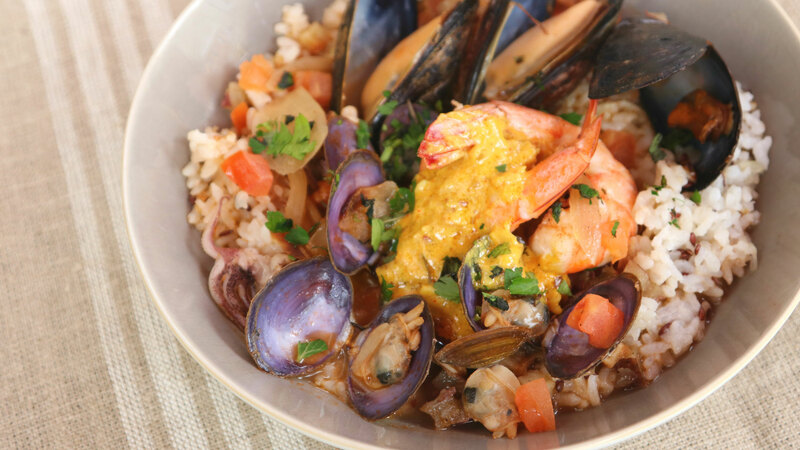 Bombo’s steam kettles will remain and be used to finish stews, including one with lobster-tomato broth, fresh fish, shrimp, squid, clams and mussels served over rice. Peel is also planning to serve dishes like warm albacore salad and fish and chips, along with grain bowls. But Peel, the California-cuisine pioneer who opened Campanile in 1989 after cooking at Ma Maison, Michael’s, Chez Panisse, Spago and Chinois, is completely serious about offering seafood at an accessible price. Many items at Prawn will be around $10, and he’s trying to make a lobster roll he can sell for $14 or $15, which is less than what some L.A. food trucks charge. Peel starts by cooking lobster meat in lobster broth with saffron, then adds some other global flavors. Peel knows he can’t charge that much at a fast-casual place, so he’s doing some things he wouldn’t do at a fine-dining restaurant. That’s where Peel’s skill, which he’s spent more than four decades cultivating, comes in handy. When I visit him at Grand Central Market, Peel is behind the counter showing an employee how to debone a salmon, remove the skin and extract as much meat as possible. The path forward for Prawn, meanwhile, is opening multiple restaurants. Peel plans to debut a Pasadena outpost in the summer and is looking to take this concept to other L.A. areas with high foot traffic. He has a commissary kitchen where broths and syrups are pressure-cooked, potatoes are baked and radishes, onions, garlic and carrots are pickled. Peel, who grew up in the San Gabriel Valley, calls the commissary “the hub” of Prawn, and he wants at least five “spokes” in L.A. He’s considering locations like Century City, Highland Park, Santa Monica and Venice, maybe even deep in the San Gabriel Valley. The fast-casual model makes Peel think about the economics of scale in a way he didn’t when he ran fine-dining restaurants. But Peel doesn’t regret that he devoted most of his career to fine dining, and he doesn’t regret working 12-hour days five or six times a week, which resulted in the thoracic outlet syndrome that makes his shoulders hurt. He could do without the carpal tunnel and the back pain and the mornings when he wonders how important it is to put his socks on, but he’s adamant when I ask if he regrets what he’s done to his body. Peel says he loves the “athleticism” of being a chef in a fine-dining restaurant, and he knows he could still run the line at one if he had to. Peel’s got a different challenge now: building a restaurant concept that he knows needs to scale for it to become successful. But he also gets to spend more time with his family because his workdays aren’t as long. Peel knows he can’t hire kitchen staff as ambitious as he once did, so he might have to spend more time training less-experienced employees. Things have changed since Peel and then-wife Nancy Silverton started La Brea Bakery and Campanile (the latter closed in 2012). But at least now there are fewer egos to deal with at work. When Peel did fine dining, there was a lot of “machismo” in the kitchen. It was about being the best, about toughness and endurance. It was about winning. But now that Peel is looking to serve a much larger population, he knows that he doesn’t have to crush other people to succeed. Trying to make seafood budget-friendly isn’t easy, but Peel sees a big opportunity. Peel starts talking about how fish, as opposed to land animals, “essentially live in a gravity-free environment.” This is the type of thing, both practical and philosophical, he’s been thinking about for decades. Before Wolfgang Puck lured him to Spago, Peel had gone back to college in his mid-20s because he wanted to understand how the world’s food supply worked. And Peel is looking at the past as he creates a restaurant group for the future. The “fricking expensive” steam kettles, which cost about $50,000 for the six he has at Grand Central Market, are something Peel remembers seeing at New York’s old-school Grand Central Oyster Bar. He likes that they’re fast and easy to clean.